As 2018 comes to an end, many real estate developers and investors are looking toward the new year and considering what challenges and opportunities are in store for the industry, and the best way to navigate the New York City metropolitan market. Will land pricing and construction costs remain high? Will interest rates continue to increase? What neighborhoods are ripe for development? What are the most attractive real estate investment opportunities? How popular will Opportunity Zones be? Before jumping ahead, it’s important to look at the current state of the economy. The U.S. economy saw continued expansion in 2018 and is in its 10th year without a recession. The U.S. economy has been expanding since June 2009, the second-longest streak of its kind in history. While speculation about the next downturn in the U.S. economy has become the chatter of the commercial real estate community, many markets continue to grow. Some experts say a correction is on the horizon, but there are differing opinions as to how much impact it will have. “We believe 2019 will still be a good year for real estate investment but it’s important to approach it with cautious optimism keeping factors such as high land pricing and construction costs, and rising interest rates in mind,” said Eran Polack, CEO and Co-Founder of HAP Investments, an international, full-service real estate development company headquartered in New York City. New York City remains the most expensive place to build in the world with an average cost of $362 per square foot, according to Turner & Townsend’s 2018 International Construction Market Survey. And by the end of this year, construction spending in New York City is expected to reach $61.5 billion—a record high in the city’s history, per a report by the New York Building Congress. Regarding residential construction spending, Building Congress anticipates it will reach $14 billion by year-end, up from $13.2 billion in 2017. They also predict that 60,000 units of new housing will be produced between 2018 and 2020, averaging around 20,000 new units per year. As real estate developers and investors plan for 2019, they are currently identifying markets for strong investment opportunities, and maybe more importantly, markets that are not ideal anymore. Neighborhoods that were promising years ago are now overbuilt and overpriced. Meanwhile, new markets are emerging, ripe for development. HAP Investments is known for identifying and developing in emerging markets from East Harlem to Budapest. According to Eran Polack, there are five trends defining the search for emerging markets in the New York City metropolitan area for 2019. Eran Polack expects the 2019 real estate market to be governed by a glut of new multifamily and residential properties and a dearth of rental assets. “There are very few rental projects under construction in New York City right now, and that means that in two to three years there will be a shortage in product and rent prices are going to rise,” Polack said. Companies should look to build or pivot to rental projects wherever they see a market void. Polack suggests looking at locations where migration patterns don’t match current rent prices. “Neighborhoods like Mott Haven in the Bronx have many people moving to them, but the supply of rental apartments has not yet caught up,” he said. Millennials are happy to live farther outside of downtown Manhattan as long as they’re still near public transit, as evidenced by the influx of young professionals to cities like Arlington, Va. and to neighborhoods like Queens. Rather than building off already-crowded lines in Manhattan, though, Eran Polack has been looking at alternative transit methods, like the PATH train and the ferry system. “One of the most exciting new areas for development is Journal Square,” Polack said, referring to the neighborhood that surrounds the Journal Square PATH train station in Jersey City, where multiple high-rises are under construction. HAP Investments has a planned 42-story luxury rental project there at 500 Summit Avenue. But even in established neighborhoods like Harlem, Polack said developers’ interest in a deal should be dictated by proximity to public transit. “New York is not like Dallas or Atlanta — residents rely on public transit. You must look at transportation on a block-by-block basis,” he said. There is a lot of industry talk about the potential for Opportunity Zone Funds—a new program that allows investors to defer capital gains taxes by investing in Opportunity Zone funds, which invest in designated under-developed areas. Although guidance about the rules around the program have only recently rolled out from the IRS, investors are already showing interest. The new Opportunity Zones program represents a brand-new incentive that could potentially bring billions of dollars in multifamily investment to distressed communities nationwide. HAP Investments is bullish on the prospect of Qualified Opportunity Zones in New York City, and believes real estate developers should not underestimate the tax benefits that these zones provide. “If you hold on to the asset for ten years, no tax is assessed on your capital gains. Those savings can be reinvested into making a truly outstanding product,” Eran Polack said. While Opportunity Zones cover large swathes of Queens and the Bronx, the neighborhoods that HAP Investments is most excited about are the ones the company already has experience in: Washington Heights and Fort George. Eran Polack believes that while construction costs, the subject of much worry in 2018, will stabilize in 2019, land prices — which have been spiking for years — will continue to rise. “Land has always been expensive in Manhattan, but recently it’s become prohibitively so. Even Brooklyn is becoming extremely difficult to develop,” Polack said. Polack has started looking for affordable land farther afield, away from the densely populated centers of the five boroughs. He mentioned that he has been looking into the eastern areas of the Bronx, Yonkers and other parts of Westchester. With land prices as they stand, developers may see better return on investment for projects outside the city center. Once developers find affordable land, Polack said, they should look to build rental assets for the coming shortage. New York’s most expensive real estate markets are still rife with opportunity for developers who are willing to dive into every aspect of a budget and keep their costs low, Polack said. He credits his experience in emerging markets with being able to find a great deal even in more expensive neighborhoods like Tribeca and Chelsea. Most recently, the company invested in select Downtown Manhattan neighborhoods including Tribeca with a planned 19-story luxury residential building at 65 Franklin Street. “We believe in Tribeca because it is very established neighborhood that is highly desirable and stable. There is more product coming into the neighborhood today, but we view it as healthy competition. This challenges us to design, develop and deliver a building that will stand out from the crowd,” said Polack. Polack did add a caveat to developers to dedicate less of their space to retail in luxury markets, as the trend in retail has shifted toward smaller-footprint locations. He said luxury developers are better off investing in amenities, services and finishes for their tenants, as these will help set a building apart from its competitors. In addition to identifying emerging real estate market trends, HAP Investments plans to continue to keep a close eye on the following neighborhoods in 2019. HAP Investments identified East Harlem as an emerging market with a lot of opportunity and started investing in the neighborhood about seven years ago. According to Eran Polack, East Harlem was attractive for multifamily development for several reasons – the company could build quality projects with great amenities for less, they could offer more affordable rents, and the projects were situated near public transportation providing residents with an easy commute to and from the center of Manhattan. “We think there are still strategic opportunities to develop in this neighborhood, so we are keeping a close eye on it, but it’s becoming more challenging to make the numbers work with rising land prices and construction costs,” he added. Washington Heights is one of the city’s most talked about, up and coming spots. It’s located in northern Manhattan away from the dense crowds and hustle and bustle, providing a quieter pace of life with a true neighborhood feeling. HAP Investments has had a successful history of identifying and investing in uniquely positioned neighborhoods in the preliminary stages of urban revitalization and believes Washington Heights is an area with long-term potential. “Northern Manhattan has become a fast-moving real estate market with a lot of activity taking place in Harlem and East Harlem, and we believe Washington Heights is the next frontier,” stated Polack. Most recently, HAP Investments celebrated the opening of The Highbridge, a new, 39-unit condominium building located at 448 West 167th Street in Washington Heights. The Highbridge is one of the only new, ground-up condominium buildings that’s been developed in Washington Heights in the last few years. 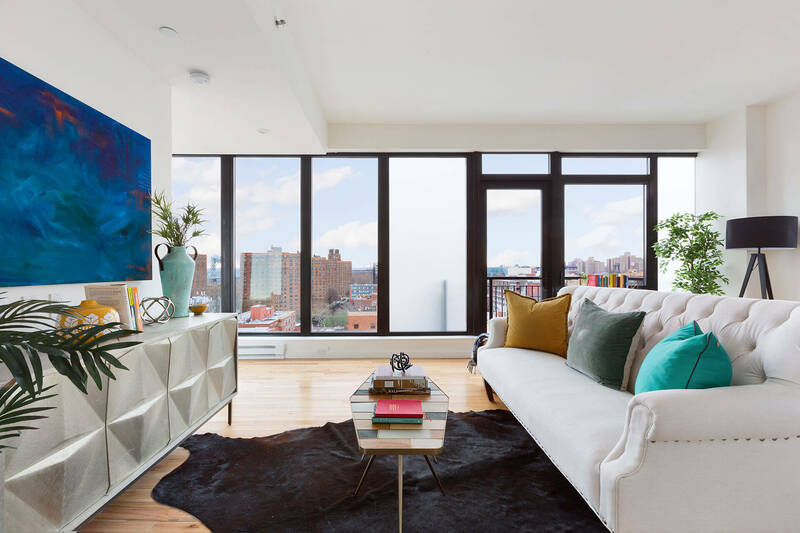 The Highbridge is approximately 87% sold, with closings underway, and the sales progress is a testament to buyers’ interest in a new, high-quality condominium building well situated in one of Manhattan’s up-and-coming neighborhoods. HAP Investments identified Jersey City as another emerging real estate market several years ago and was one of the first developers to invest in the Journal Square neighborhood of Jersey City with its project at 500 Summit Avenue. The planned 42-story luxury rental tower will offer sweeping views of the New York City skyline and convenient access to the PATH train into downtown Manhattan. “We think there are still good investment opportunities in Jersey City as the area continues to grow. There has been tremendous development activity, an influx of businesses moving to the area, and the region has attracted a lot more people looking for quality living options at more affordable prices compared to Manhattan,” stated Polack.